Be ready to play the most exciting driving game, where you can play as a tank driver. You can destroy a lot of building on your way and just have so much fun here. Do you think that it is so easy? Then just try it right now and enjoy the game. Have you ever dream to drive a real tank? Then this is your chance! 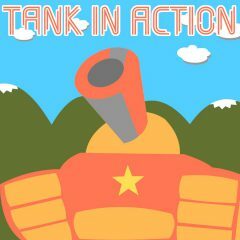 So, as you know every riding game needs something to distinguish...why not a tank? So, each level is designed for use of the tank to run over obstacles, or maybe blast them out of the way. Bu you should try to keep in mind some levels require a bullet shot to make bridges appear. By the way, water will damage the tank, as well as too much damage to the structure. Can you make it to the flag in as short amount of time as possible? Then just do it right now and have so much fun!